Recycling paper crafts for kids and adults are a nice way to help protect the environment and create eco friendly handmade winter holiday decorations for birthdays and family dinners, Christmas and New Year Eve parties. Every day people throw away tons of paper in offices and homes. Recycling paper and turning it into winter holiday decorations for homes and offices is a great idea, that saves money and encourages creativity. Recycling paper while making snowflakes provides hours of fun and great winter crafts for kids. Used paper, old magazines, newspaper and phone books are great materials for making snowflakes, creating cheap handmade decorations and recycling paper. Easy snowflake projects for recycling paper are geared to people of all ages. 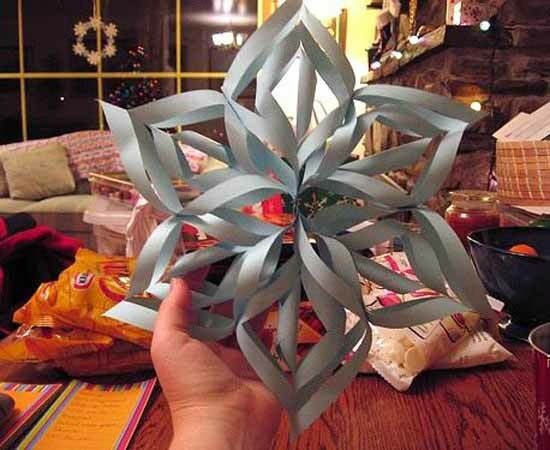 Making snowflakes of used paper, that clutter modern homes and offices is easy and quick to learn. Any paper, craft paper or writing paper, can be used for creating light and versatile snowflakes that make gorgeous winter holiday decorations and add charm to Christmas or New Year Eve party decor. Snowflakes are so different. Recycling paper and making snowflakes allow to get creative and design one of a kind winter holiday decorations for your home or office. Handmade snowflakes are perfect for any special event in winter, Christmas and New Year Eve party decorating. Use square or rectangular pieces of paper. You will need six pieces of paper for each snowflake. 1. Fold a piece of paper diagonally to create a triangle. Cut the excess of paper, if you started with a rectangular piece. Select the height of the triangle. It will be the reference line for cuting strips. 2. 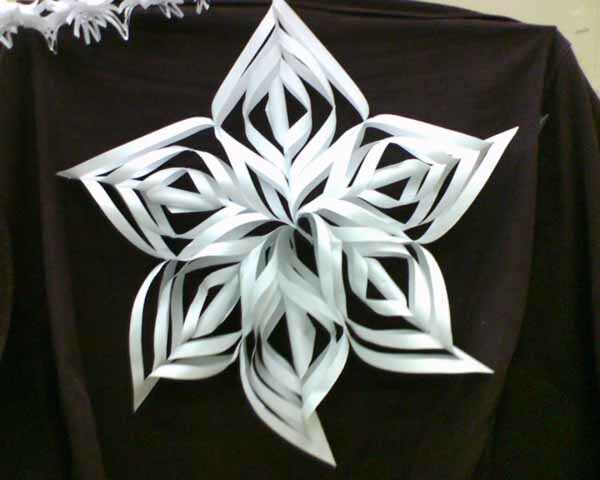 Make a few cuts to create strips and then start to design a snowflake detail. 3. First fold the smallest stripes toward each other and staple them together. 4. 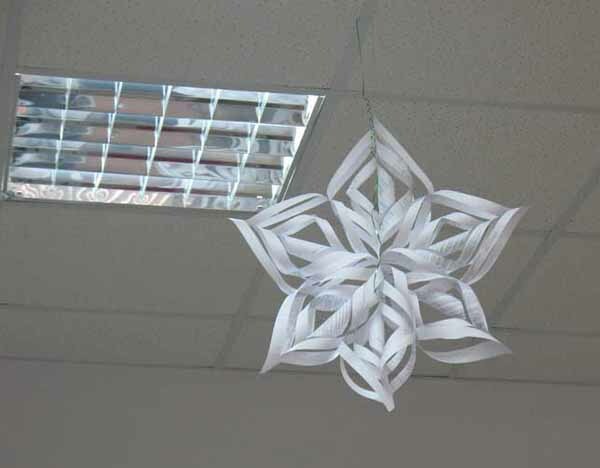 Turn the snowflake detail upside down and fold next larger stripes towards each other, using a stapler to hold them together. Turn a snowflake upside down again and repeat the same for all stripes, creating one of six details of a snowflake. 5. Create five more snowflakes details, repeating the process. Then start designing a snowflake. Staple together three details to create a half of a large snowflake. Staple the left and right parts of a snowflake together. 6. The snowflake is ready for gorgeous window, ceiling or wall decorating. Use snowflakes as attractive, eco friendly and cheap decorations for winter holidays, adding creative and unique decorative accents to birthday, Christmas or New Year Eve party decor.